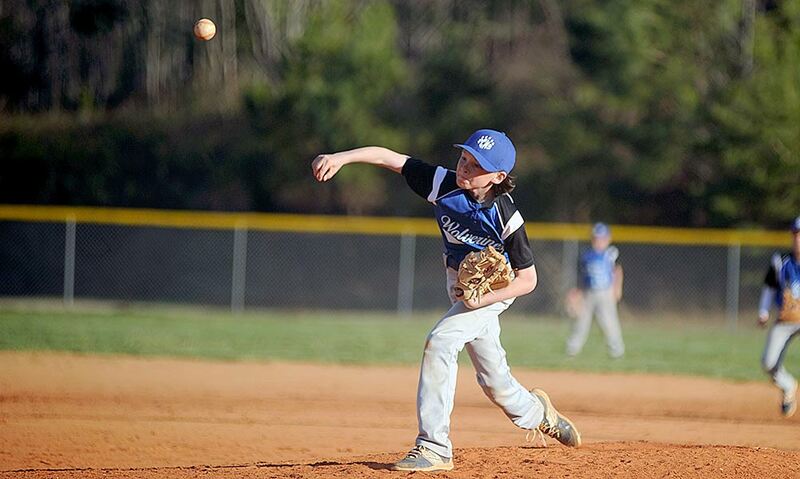 Polk County Middle took care Monday of all the small baseball details – and got a much-needed win as a result. Flawless in the field, smart at the plate and quality pitching added up to a 7-1 win for the Wolverines over Apple Valley in Blue Ridge Conference action at Polk County Recreation Complex. The Wolverines (4-4) snapped a three-game losing streak with the win. Polk Middle batters drew 11 walks and had three hit batsmen and Angus Weaver teamed with Cohen Edwards on a two-hitter. “We definitely needed a win to boost our confidence,” said Polk Middle head coach Kenny Hall. “And we needed a win to keep ourselves in the conference race. Polk Middle posted four runs in the bottom of the first to take quick control of the game. Gunnar Alm dropped a bunt down the third-base line to lead off the inning, with Evan Jones reaching on a one-out walk and Weaver being hit by a pitch to load the bases. An error on Gabe Alvarado’s grounder allowed Alm to score, and Jones scored on another error. Weaver came home on Bryson Jones’ grounder and Alvarado later scored to make it 4-0. The Wolverines picked up another run in the third as Lawson Carter and Alm walked to open the inning. Jayce Edwards moved the runners over with a sacrifice, and Evan Jones singled to drive in Carter to give Polk a 5-1 lead. Polk then picked up its final two runs in the fourth. Weaver and Alvarado each walked to start the inning, with a walk to Bryson Jones with one out loading the bases. Edwards’ grounder to short brought home Weaver before Carter drilled a two-out single to left for the final run. Alm, Evan Jones and Carter had the Wolverines’ three hits. The Wolverines are back on the field Thursday, traveling to Hendersonville Middle.